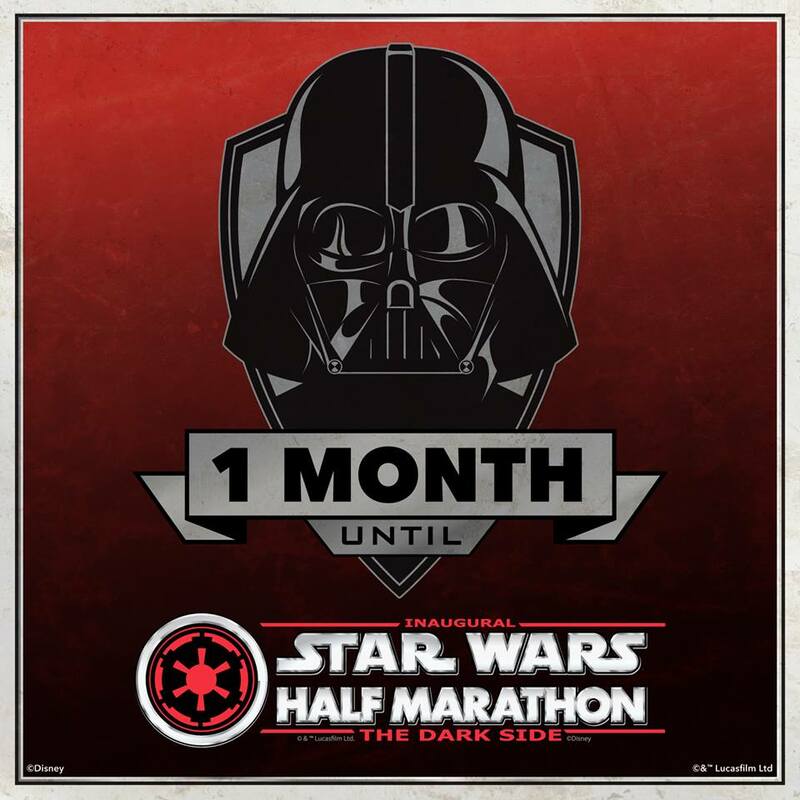 We're in the official one month countdown until Star Wars Half Marathon - The Dark Side Challenge at Walt Disney World! 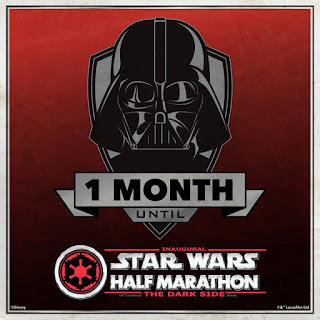 I honestly feel like it was just yesterday that I signed up for the Dark Side Challenge. I wasn't going to sign up for this event and ended up signing up for the challenge. Go figure! With only 4 weeks to go, I better figure out what my running costumes are going to be for this event. Star Wars Half Marathon official event guide was released yesterday which shows the Star Wars Half Marathon Course and the Star Wars 10K course. Both of these are new events to runDisney and that means brand new courses! 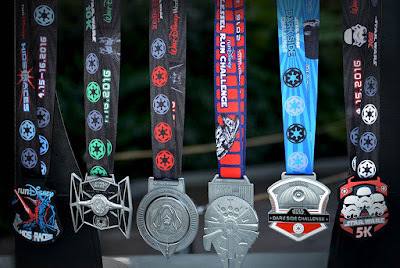 The Star Wars Dark Side Medals were released a while back but in case you missed that - here they are. As someone who has ran the Marathon Weekend Half and Princess Half course Marathon a ton of times, I am quite excited for running a new 13.1 course through Epcot, Hollywood Studios, Animal Kingdom and Wide World of Sports. 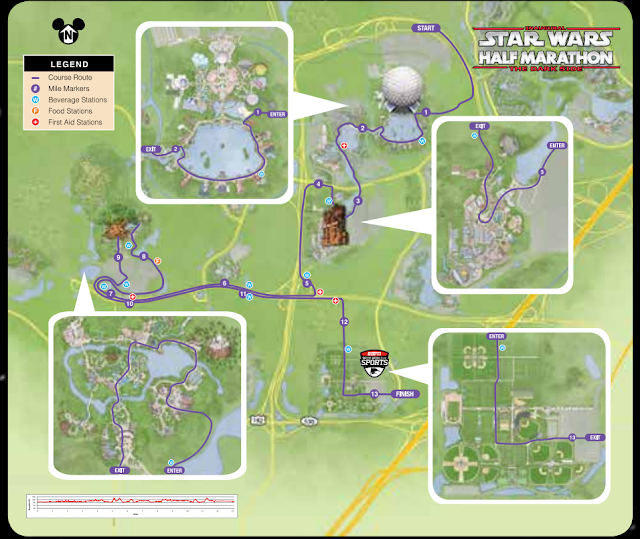 Corral Walk Out: 4:00 a.m.
Star Wars Half Marathon Course Description: Jump into hyperspace and take off during the Star Wars™ Half Marathon at Walt Disney World ® Resort. 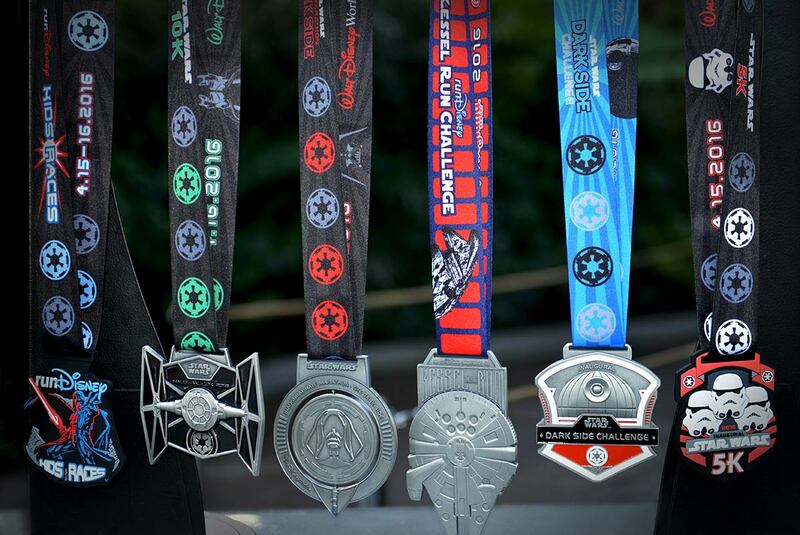 It’s a 13.1 mile intergalactic adventure in the most magical place on Earth. Your course takes you through Epcot ®, Disney’s Hollywood Studios, Disney’s Animal Kingdom® Theme Park, and then on to the ESPN Wide World of Sports Complex. Follow the path to the Dark Side with your favorite Star Wars™ characters cheering you on your galactic journey. Never underestimate the power of the Dark Side. Corral Walk Out: 4:30 a.m.
Star Wars 10K Course Description: Feel the power of the force as the Star Wars™ 10K course speeds through Epcot on its way to Disney’s Hollywood Studios. Your adventure continues on to ESPN Wide World of Sports Complex, where a finish fit for Stormtroopers awaits. GPS devices or other sources will be inaccurate due to road closures. Please use the provided directions. Take I-4 to exit 65 (Osceola Parkway West) and follow the signs to Epcot . Guests coming from (192) are strongly encouraged to follow signs to Disney World via the World Drive Exit because there will be SIGNIFICANT DELAYS starting at 3:30 a.m. due to road closures. For Guests driving to Epcot ® on Saturday and Sunday, EXPECT SIGNIFICANT DELAYS! Roads begin to close as early as 10:00 p.m. on the evenings before the 10K and Half Marathon. 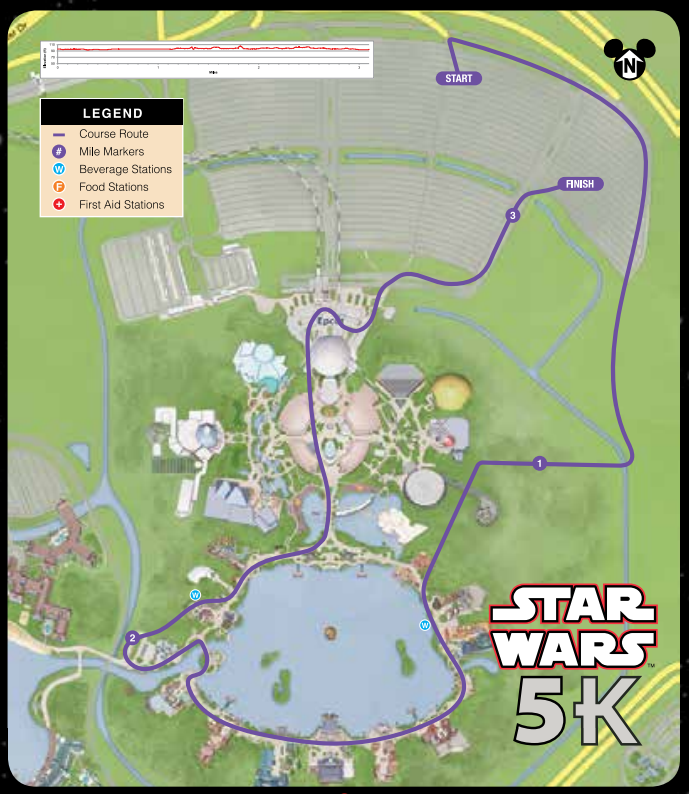 Star Wars 5K Course Description: It is a Dark Side event for everyone Friday morning for the Star Wars™ 5K. May the force be with you as you make your way into Epcot ® and around World Showcase. After you pass Spaceship Earth, it’s onto a galactic finish worthy of the Sith Lord himself. Take I-4 to exit 64 (192 West) and follow the signs to Epcot ®. Thursday April 14: 10:00 a.m. – 7:00 p.m.
Friday April 15: 9:00 a.m. – 7:00 p.m.
Saturday April 16: 10:30 a.m. – 4:00 p.m.
All event weekend participants are required to attend Packet Pick-Up in order to receive your race bib, bag check sticker, gEAR bag, and race shirt. Packet Pick-Up will not be available on race morning. A waiver must be completed and signed by each participant. You need your signed waiver and a Photo ID in order to receive your packet. No exceptions. If the participant is under 18 years old, the waiver must be completed and signed by a parent or legal guardian. 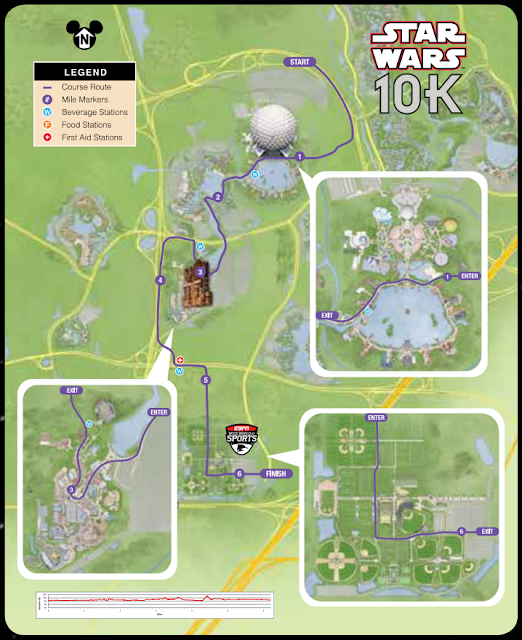 A link to the waiver will be available at runDisney.com. If you do not have access to the Internet or lose your waiver, onsite waiver printing will be available. Once you pick up your packet and commemorative items, please proceed pick up your race shirt and gEAR bag in Jostens® Center for the 10K and Half Marathon, and in HP Field House for the Dark Side Challenge and 5K.